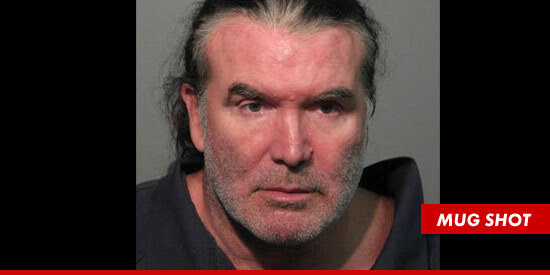 Wrestling legend Scott Hall was arrested Friday after allegedly choking out his girlfriend in a drunken fit of rage — this according to the arrest report, obtained by TMZ. According to the report, cops were called to Scott’s Florida home over a domestic disturbance in progress around 5pm. When they arrived, Scott’s GF Lisa Howell informed police he had attacked her. According to Lisa, Scott had been drinking for days and the two had gotten into some kind of argument. Lisa says she got into her car, and in a blind rage, Scott grabbed her by the throat and tried to pull her out of the driver’s seat. According to the report, police confronted Scott — who appeared heavily intoxicated with an “unknown white secretion flowing from both sides of his mouth” — but he denied ever getting violent. Police observed several signs of physical injury on Lisa — including red marks around her neck — so they placed Scott under arrest for domestic battery. Scott — billed at 6’7″ and 287 pounds — required TWO sets of handcuffs. But his problems didn’t end there — according to the report, Scott was so drunk … the jail refused to book him … so the arresting officer had to drag him to a nearby hospital to get medical clearance. The physicians gave their thumbs up and Scott was brought back to the correctional facility, where he was finally booked on the domestic violence charge. Lisa has refused to press charges. So far, it’s unclear if the case will move forward.